ราคา : 3840 บาท สั่งซื้อ! ราคา : 3540 บาท สั่งซื้อ! ราคา : 4200 บาท สั่งซื้อ! ราคา : 1360 บาท สั่งซื้อ! ราคา : 8150 บาท สั่งซื้อ! ราคา : 460 บาท สั่งซื้อ! ราคา : 3740 บาท สั่งซื้อ! Important Made in USA Origin Disclaimer: For certain items sold by Walmart on Walmart.com, the displayed country of origin information may not be accurate or consistent with manufacturer information. For updated, accurate country of origin data, it is recommended that you rely on product packaging or manufacturer information. The 16" Huffy Disney Princess Girls' Bike with Heart Basket will make your little girl feel like a real princess. This bike features a rotating bell and streamers that dangle from hearts on the ends of the grips. It's fully decorated with a Disney Princess design. The padded seat is comfortable and height adjustable. Coaster brakes provide smooth stopping, while wide training wheels add stability. Great news! If you select Site to Store delivery, you can call your local store as complimentary assembly may be offered at that location. Bring home the magic when you purchase this Huffy Disney Princess 16" Girls' Bike with Heart Basket. Enhanced with charming details like a heart-shaped front basket that has room to carry a favorite doll or stuffed toy, this Huffy Disney princess bike is twice the fun. Featuring a rotating bell and streamers that dangle from hearts on the ends of the grips, this Huffy 16" girls' bike will make your little girl feel like a real princess. The steel frame bike includes a coordinating padded seat with a height easily adjusts via the alloy quick release. 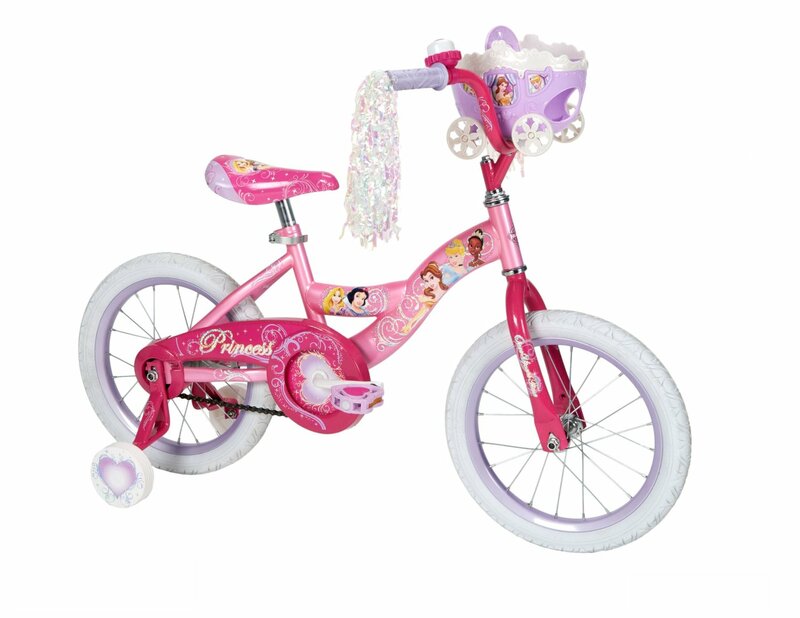 Fully decorated in a princess design, this Huffy Disney Princess 16" Girls' Bike is a treat to ride. Featuring an easy-to-use coaster brake, the Disney bike also has sturdy steel training wheels are wide for added stability. Bring it home today.